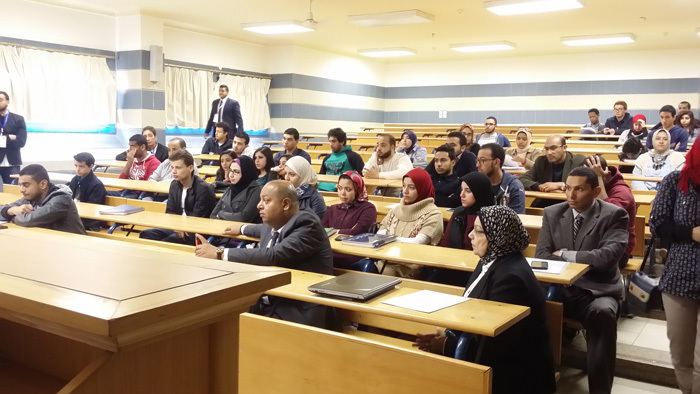 The Faculty of Financial and Administrative Sciences organized a seminar entitled ‘How to succeed in an Interview’ in coordination with Student Activities Administration in order to help students find their way to international companies. 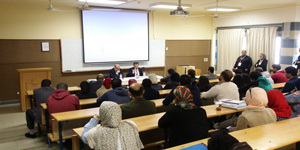 Prof. Ramadan Abul Ela -Vice President of the University – was there along with many distinguished guests: Mr. Aala Hassab-Allah, External Affairs Manager at Unilever Company, Mr. Ehab Ata-Allah Zakaria – Chairman of the Board of Directors at Misr Al Salam Company, and Dr. Nagwa Muhammed, student activities organizer. Prof. Abul Ela gave some presents to the guests, like PUA logo medallions as symbolic gifts.